The top deck easily adjusts from 95″ high (for forward door entry) To 105″ high (for aft door entry). Just push or pull on a lever and the ‘counter balanced deck’ rises or lowers with little effort and without hydraulics.Heavy duty steel construction. More than ample cross bracing for durability and long service life. More than ample cross bracing for durability and long service life. O.S.H.A. compliant forward assent and descent stair. Hand rails: Signature design of heavy wall 1.5″ round steel tubing mounted to stair rail in two places at lower end. This design avoids potential damage and creates a very sturdy unit both in up and down and side to side action. Single action plunge brakes. Just pull back on a lever and the GSE stand is locked in place. Adjustment lever: Just push or pull on a lever and the counter balanced deck raises or lowers with little effort. Main wheels: 2 – 16″ x 4″ Solid rubber main wheels feature heavy-duty axles and hubs. Swivel wheels: 2 – 8″ x 2″ Urethane over steel wheels with precision bearings and heavy-duty axles KPL swivels. Steps: Galvanized steel grip strut (saw tooth design)** with signature baked on safety yellow leading edge. Ergonomic Design: Ensures ease of use, safety, and increased productivity. Finish: Powder coated with WAAG high visibility orange (other colors on request) and a second powder coat of U.V. resistant clear. Shipping: Shipped in two pieces. Complete deck on a pallet. The main stair unit with handrails zip tied to the side. F.O.B. Waag, Van Nuys CA. *Any size stand can be made to order. Two Deck Size Options:Choose between 102″wide or 120 wide. #50143 Top Deck Usable Space: 120″ wide x 48″ deep. #50198 Top Deck Usable Space: 102″ wide x 48″ deep. Main Stair footprint: 144″ long x 94″ wide. Steps: 34″ wide x 9.5″ deep. 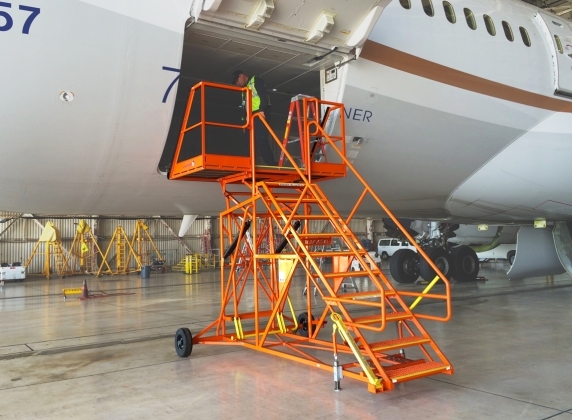 WAAG is the industry-leading manufacturer of durable, reliable aviation ground support equipment made in the U.S.A.
© 2018 Waag.com. All Rights Reserved.